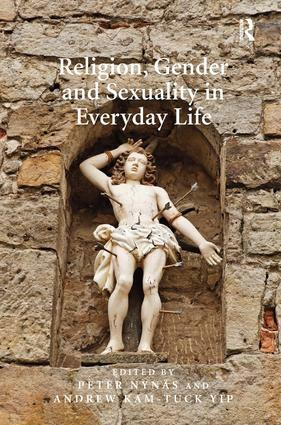 Exploring the intersection between religion, gender and sexuality within the context of everyday life, this volume examines contested identities, experiences, bodies and desires on the individual and collective levels. With rich case studies from the UK, USA, Europe, and Asia, Religion, Gender and Sexuality in Everyday Life sheds light on the manner in which individuals appropriate, negotiate, transgress, invert and challenge the norms and models of various religions in relation to gender and sexuality, and vice versa. Drawing on fascinating research from around the world, this book charts central features of the complexities involved in everyday life, examining the messiness, limits, transformations and possibilities that occur when subjectivities, religious and cultural traditions, and politics meet within the local as well as transnational contexts. As such, it will be of interest to scholars of sociology, anthropology, geography and cultural studies examining questions of religion and spirituality, gender and sexuality, and individual and collective identities in contemporary society. Peter NynÃ¤s is Professor of Comparative Religion at and Director of The Center of Excellence in Research, 'Post-Secular Culture and A Changing Religious Landscape in Finland' at Ã…bo Akademi University, Finland. He is editor of Transforming Otherness. Andrew Kam-Tuck Yip is Professor of Sociology at the University of Nottingham, UK. His research interests include contemporary religious/spiritual identities, sexual identities, youth culture, ageing, and human rights. His writings have appeared in journals such as British Journal of Sociology, Sociology of Religion, Theology & Sexuality, Sexualities, Sociological Research Online and Contemporary Islam. He is also the author of Gay Male Christian Couples: Life Stories (1997); and co-author/co-editor of Lesbian and Gay Lives over 50 (2003), Queer Spiritual Spaces: Sexuality and Sacred Places (2010), Religion, Youth and Sexuality: A Multi-faith Exploration (2011), and The Ashgate Research Companion to Contemporary Religion and Sexuality (2012).